Greenville Mall was constructed in 1978, and, soon after, the larger Haywood Mall was constructed less than a mile away. For years, the two malls seemed to coexist rather well, but this all changed in 1995, when Haywood Mall expanded, snatching Dillard's, and making it noticeably larger than Greenville Mall. Greenville Mall also had Dillard's- on the end closest to Haywood Mall (whose Dillard's was also on the end facing Greenville Mall- you could probably see each from the parking lot) . Greenville Mall decided to go upscale, and the mall underwent what appears to be a massive renovation. The renovation was nice- the mall's atmosphere far surpassed the shoddy Haywood Mall- and every part of it looks rather new. In fact, it's the best looking dead mall I've seen, and still looks very presentable. 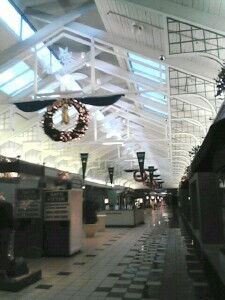 Unfortunately, a pleasant atmosphere can't make up for lousy anchors, which Greenville Mall had. The first of the 3 anchors to leave was Montgomery Ward, which held on till the very end. Not surprisingly, Dillard's finally gave up on operating two stores right next to eachother, and closed their Greenville Mall location. Perhaps the most dissapointing- and dooming- closure was that of its last real anchor, Proffit's. Now the mall sits with a semi-anchor, Oshman's sports. The food court is down to Chick-Fil-A and a Chinese restaurant. Shopper traffic is next to nill, and the future doesn't look bright at all. Really, there isn't much hope for this mall. It could possibly move downscale, but with the loss of Proffit's, there's now axis to swing the mall back to life. Also not helping: the only anchor visible from the freeway was Dillard's, and seeing an empty Dillard's building doesn't help encourage shoppers. If deadmalls.com had been around in the early 1990s, Greenville Mall could have been its first feature, having nearly died after a long slide into decrepitude since the late 1980s. Resurrected from the dead by Urban Retail Properties, which squandered a fortune in transforming it from a dilapidated center into a beautiful and upscale mall, my beloved Greenville Mall was murdered in 2004, largely a victim of decisions made by executives of its department store anchors. Greenville Mall opened in 1978 in a great location at the intersection of two interstate highways in a growing suburban area of Greenville, South Carolina. Anchored by JB White and Montgomery Ward, the mall featured about 70 mid-market stores such as Gap, a McCrory's five-and-dime, Weathervane, Rite Aid, Friedman's Jewelers, Pearle Vision, Casual Corner and the ever-present Chic-fil-A, a Southern mall fixture. Unfortunately, Haywood Mall, a larger mall, opened in 1980 at the next exit down I-385 on Haywood Road, which sprouted strip malls, chain restaurants, movie theaters and hotels like weeds soon after Haywood Mall opened. As the area around Haywood Mall boomed, Haywood quickly became the dominant mall in Greenville. Although Greenville Mall continued to add stores during the early 1980s, it was relegated to being Greenville's laggard mall, after Haywood and McAlister Square. As Greenville Mall's peach walls, white tile floors and 1970s d‚cor faded, the mall was not renovated and by the early 1990s most of the mall's small stores and its movie theater had fled to Haywood Mall or had closed completely. Haywood Mall and McAlister Square seemed to have prevailed in their battle with Greenville Mall. In 1995, Greenville Mall was resurrected from the dead. Urban Retail Properties and other investors poured a substantial amount of money into Greenville Mall, expanding it and replacing the few tired and ratty low-end stores that remained with a multitude of upscale stores: Parisian, Williams-Sonoma, high-end white-tablecloth restaurants and Talbots and eventually Harold's, Eddie Bauer, a Drexel Heritage furniture store, April Cornell and more. The mall's interior was transformed into a beautiful garden-like setting and the exterior was completely redone. Perhaps developers thought that since Greenville Mall had failed as a mid-market to low-end mall in a town saturated with mid-market stores, it would thrive as a high-end mall. They were wrong. Unfortunately Haywood Mall also expanded in 1995, luring a Dillard's away from McAlister Square, which eventually caused McAlister's death. If Greenville Mall had only completed its renovation before Haywood Mall expanded, Greenville Mall could have lured many of the stores, such as bebe, Banana Republic, Nordic Track and others, that found homes in Haywood's new wing and could have thus had enough of a critical mass of stores to effectively combat Haywood Mall. Haywood thus retained its position as Greenville's dominant mall, and Greenville Mall, as beautiful as it was, remained a relatively quiet alternative to bustling Haywood and remained only perhaps two-thirds full, having never leased many of its empty spaces. Then a variety of incidents led to Greenville Mall's quick death. In the late 1990s, Dillard's bought the JB White chain and converted the Greenville Mall store to a Dillard's. As the Haywood Mall Dillard's was larger and fancier than the Greenville Mall one and was only about a mile or so away, the Haywood store cannibalized the Greenville Mall store's business. The Greenville Mall store was partially converted into a clearance center, and many of its departments, such as men's shoes, were dropped before the store closed in 2003. Loss of that anchor seemed not to impact traffic in the main part of the mall, as the store had been deserted for years, with only a few cars in its parking lot and only a few customers, even at busy times. Greenville Mall's crown jewel, Parisian, was bought by what is now Saks Incorporated in the late 1990s. Saks bought a JB White store in the neighboring town of Spartanburg and converted it to a Proffitt's store when Dillard's bought JB White. My beloved Parisian was also converted into a Proffitt's in 1999 and its Joseph Abboud ties and other high-end products were removed. The Parisian sign above the mall entrance was taken down; a white board covered up the holes where the Parisian letters had been hung, and a Proffitt's sign was simply hung in front of the white board, as tacky as it was. I was absolutely despondent. The days of finally having a high-end department store in town were over. I never set foot in the former Parisian again except to walk through the store and reminisce about its former glory. Although the center's Montgomery Ward apparently performed well, having survived rounds of store closing, the Greenville Mall location was felled when the chain shut down. Although the mall's only remaining anchor was Proffitt's after the other two anchors closed by early 2003, most of the mall's high-end shops survived until Proffitt's closed in the spring of 2004. My last visit to Greenville Mall, including my final cruise through the parking lot, past the large red "LIQUIDATION SALE" banner hung at the Proffitt's entrance, was in the spring of 2004. Since then, Williams-Sonoma has departed for Haywood Mall, although Harold's and other stores seem to have survived. Plans to convert Greenville Mall into a lifestyle center, similar to the booming Plaza at Greenville Mall strip mall built to the east of the mall in the late 1990s, have been floating around for years, and hopefully Greenville Mall's few remaining high-end tenants will stay until the center is resurrected again. I like to think that Greenville Mall is the town's version of Manhattan's Shops at Columbus Circle: a very tony mall without anchors and with lots of quiet spaces. I loved Greenville Mall because it was a tranquil yet elegant center with classy and elegant stores. If only Greenville Mall had different anchors, it would likely have survived; if Haywood Mall's anchors were part of chains that merged and went bankrupt, perhaps Greenville Mall would have been the mall that survived. Greenville Mall has a great location, and the booming strip mall in its parking lot and thriving movie theater show that the site has great potential. Having failed twice as a regional mall, I think a lifestyle center represents the mall's best hope at a third life. Greenville Mall in Greenville, South Carolina is a story of unfortunate circumstances: tough competition from a neighboring mall, poor timing and corporate mergers and bankruptcies in distant cities that twice killed a mall that otherwise should have thrived. Greenville Mall opened in 1978 in a prime location near the interchange of Interstates I-85 and I-385. It was originally a mid-market mall, featuring JB White, Montgomery Ward and in-line tenants such as Gap, Weathervane, Camelot Music, a Rite-Aid drugstore, a McCrory’s five-and-dime and other stores. Unfortunately Haywood Mall opened two years later at the next highway interchange. Haywood Mall had four anchors and more in-line tenants, so even though Greenville Mall eventually nearly fully leased its in-line stores during the 1980s, it was overshadowed from shortly after its opening. Although Greenville Mall’s two department stores seemed to perform well, the mall was not remodeled or updated for years and by the early 1990s most of the in-line tenants and the mall’s two-screen movie theater had closed. The mall’s selection of mid-market stores and 1970s peach and purple décor didn’t attract enough shoppers. Although Greenville Mall was nearly completely vacant except for its anchors, developers tried again, perhaps in the hopes that the mall’s first-rate location would bring success. In 1995 the mall was completely remodeled and expanded. The mall’s interior was completely rebuilt and the exterior was re-done; the new Greenville Mall was beautiful. A Parisian department store was added, along with relatively high-end tenants: Williams-Sonoma, a Drexel Heritage furniture store, Harold’s, The White House/Black Market, Crabtree & Evelyn, Talbot’s, April Cornell, Eddie Bauer and others. In 1997 a 20-screen movie theater was added, and shortly thereafter a strip mall with Old Navy and other tenants was built in the mall’s parking lot. Unfortunately the new Greenville Mall did not perform as well as it should have for several reasons. First, Haywood Mall also expanded in 1995, adding a new Dillard’s and about 30 new shops. I believe that if Greenville Mall had expanded and re-opened before Haywood did, Greenville Mall would have performed much better; even though Greenville Mall attracted the lion’s share of high-end tenants that were new to the market, even at its peak the mall was probably 30% vacant, as Haywood Mall attracted many new stores as well, and Greenville Mall never reached the critical mass of stores that Haywood did. If Greenville Mall had re-opened in 1994, it would have attracted a lot more new stores and would have reached the critical mass necessary to compete with Haywood Mall. Second, Greenville Mall’s design was not as effective as it could have been. Although the movie theater attracted throngs of customers and was certainly the dominant movie theater in upstate South Carolina, it was not connected to the mall; patrons would simply drive around the mall to park near the movie theater, and the long lines of cars heading to the movie theater impeded access to the mall. If the movie theater had been added on to the mall itself, the added traffic of customers walking through the mall to reach the movie theater would could have significantly helped sales. Additionally, the Plaza at Greenville Mall strip center was built far away from the mall, so the hordes of customers for Old Navy and the other stores in the strip center did not have to walk through the mall. I have heard that mall management did not want to dilute the image of Greenville Mall as a high-end mall by adding Old Navy and other stores to it, but surely from a developer’s perspective a mall with an Old Navy in it would be preferable to a dead mall. Additionally, Greenville Mall lacked mid-market chain restaurants that people in Greenville love; several relatively expensive sit-down restaurants occupied one spot in the mall, but none of them attracted the throngs of customers that a California Pizza Kitchen or the like could have done. Third, Greenville Mall had an unfortunate choice of anchors; if Haywood Mall had the same anchor-related problems, Haywood might have died as well. In 1998, Dillard’s bought the Mercantile Stores chain, which owned JB White, and the Greenville Mall JB White was converted to a Dillard’s. As Haywood had a larger and more elegant Dillard’s, the Haywood store cannibalized the Greenville Mall store’s business, and the Greenville Mall store closed in 2003. Second, the Montgomery Ward chain closed in 2001; even though the Greenville Mall store appeared to do well, it was forced to close. Third, Saks Incorporated bought the Parisian chain in the late 1990s and bought the JB White store in neighboring Spartanburg; it converted the Spartanburg store to a Proffitt’s store and did the same to the Greenville Mall Parisian, apparently to reduce distribution and marketing expenses. Parisian was the most upscale department store in Greenville and should have been a magnet for Greenville Mall; while Proffitt’s was a very well-run store and surely had many loyal fans, Proffitt’s was similar to other department stores in Greenville, such as Belk, and competed in a more crowded niche than Parisian did. Proffitt’s is scheduled to close in May 2004. Thus Greenville Mall will be an mall devoid of department stores by mid-2004, and Williams-Sonoma is moving to Haywood Mall as well. The stores that are left at Greenville Mall: Oshman’s, Harold’s, Eddie Bauer, The Finish Line, Talbot’s and a few others, appear to perform very well; unfortunately, a handful of in-line stores are probably not enough to keep a mall in business. Numerous plans are in the works for the redevelopment of Greenville Mall; as its movie theater and strip mall portion perform well, perhaps it will be developed into a lifestyle center. Greenville Mall’s location, surrounded by upper-income neighborhoods and in a growing area, is one of the best in Greenville. Hopefully the mall’s third incarnation will do better than its first two did; perhaps next time the mall will not be cursed with anchor mergers and bankruptcies. Other areas in Greenville, such as downtown, have thrived as retail centers by completely differentiating themselves from Haywood Mall; perhaps if Greenville Mall is thus re-done as a lifestyle center rather than as an enclosed mall, it will be a success. Greenville is overmalled, not from an economic standpoint, but from a geographical one: The 3 "malls" we still have at this point are within 5 miles of each other. For a metro area of about 300,000, this isn't exactly conducive to retail success. Greenville Mall was Greenville's third mall to open, after the ill-fated Bell Tower Plaza/Mall and McAlister Square. Opening around 1978, Greenville Mall was your typical late-70s 2-anchor mall, with dark corridors and that dark wood interior (or so I've read...I wasn't living here then). On the west end, you had J.B. White's, a regional chain eventually part of the Mercantile Stores. On the east end, you had Montgomery Ward, and a little beyond that, a 2- or 4-screen movie theater. There was no anchor overlap between McA and Greenville Malls, and things hummed along for a while, although the popularity of Greenville Mall was never as high as its neighbor 2 miles to the east, Haywood Mall, which opened in 1980. The plot of land the mall sits on is so-so. Woodruff road is perhaps the 2nd busiest in the county, and I'm sure some stretches rank #1. The main drawback is that I-385 runs right up to the back edge of the property. Most malls, of course, have 4 sides to them. Greenville Mall has only 3. And because of the freeway, there was no option for expansion on that side of the mall. Amid declining sales, and the threat of yet another mall (albeit one 15 miles away, this time), something had to be done, and done it was. The mall underwent a truly massive renovation and expansion in 1996 or 1997. The old, dark wood corridors were gone, replaced by skylights and a white interior which gives the mall quite an open feeling. Instead of just having to boxes at the ends of a long mall, some "kinks" were put in, along with a stage and a fountain, and a new foodcourt area was added just outside of J.B. White. The biggest changes, though, involved everyone but J.B. White, although they did add on a little portion to their store. First, Monty Ward's built a new store about 100 yards or so closer to Woodruff Road from where they had been. According to newspaper reports, this was a new type of "concept" store, although I can't tell you much about it since I never went inside. Oshman's SuperSports moved into the old Montgomery Ward's space, and in fact, there is still some labelscar on the exterior of Oshman's (on the rarely-used backside, no less). Secondly, the mall added a new anchor: Parisian. The new-build store was dead-center between J.B. White and Ward's. Along with Parisian came a few more upscale tenants such as the area's only Williams-Sonoma and Eddie Bauer stores, along with Harold's. On par with the Parisian addition was the replacement of the old theater with a new 20-screen theater complete with stadium seating. After the renovation, the mall positioned itself as a more upscale shopping experience. Indeed, I like to shop there myself, not because of the more upscale stores, but because the mall is quiet and not full of teenagers. I guess you could say the mall was kind of like the strange uncle every family has: It's there, it's genuinely nice, but it is a little odd, and you only see it for a reason. Everyone here knows what happened to Montgomery Ward. The store lasted fairly late into the whole process, which I guess says something for the mall. To this day the Montgomery Ward sign still hangs on all three sides (the one in the "Ward's" font, not the 70s kind...and this one spells out both words, even though they were advertising themselves as Ward's at this point). So a mall loses one anchor, and naturally, traffic starts to drop off at that end. Well, a few years later, Dillard's bought J.B. White through the Mercantile acquisition. So now we have 2 Dillard's stores operating within 2 miles of eachother. And at no surprise to me, the Greenville Mall Dillard's is turned into one of those infamous "clearance" stores. It used to be a full-line store downstairs, while upstaris held the clearance items. Eventually, the clearance items encroached on the downstairs space, at which point the mens department was removed and replaced with mens clearance items. In April of 2003, Dillard's closed the Greenville Mall store (duh!). So now, the mall has lost another anchor, leaving Oshman's and Parisian, which rebranded itself as Proffitt's at some point. Having gone to grad school in Knoxville, where Proffitt's is based, I must say that I was disappointed in this store. It wasn't huge, granted, but they never seemed to put as much merchandise in it as I thought they could (ever been to West Town in Knoxville?). Still, I love Proffitt's and would still go there first before I made the trek to Haywood Mall. Before Dillard's had left, there had already been some talk about turning the mall into a "lifestyle center." Read: big box it. The departure of Dillard's pretty much put those plans on hold. The mall teetered along for a while longer. While there were certainly reasons to go there -- Eddie Bauer and Williams-Sonoma -- those were the only reasons to go there. I always felt that those two would pick up and leave when space became available at Haywood. And indeed, W-S is doing just that. Two weeks ago it was announced that Proffitt's is closing its Greenville Mall store due to underperformance. I had a coupon, and needed some houseware items, so I went this past weekend. It was my first time probably since January, and little has changed. There are few cars in the parking lot, and few people in the mall. Even the pet store is gone. I daresay that the mall is 65-70% vacant. Unfortunately, the handwriting is on the wall. It was there, really, the moment Dillard's bought J.B. White. Interestingly enough, the strip ouside the mall is doing fine, with a Goody's, Old Navy, CompUSA, and A.C. Moore Crafts. Up until last year or so, this strip was considered to be part of Greenville Mall, was owned by the Mall, and appeared on the mallmanacs, even though there was a vast parking lot separating the two. So...you have a mall that's teetering along...and you have a wildly popular strip. What do you do? Sell the successful one, of course! So now the strip is, I suppose, unencumbered by the white elephant. The county missed on a big opportunity to do something about this chunk of real estate, as they just plowed down a nice bit of land just across I-85 to put in...a new shopping center! Just what we need on Woodruff Road. Why they couldn't adapt the Greenville Mall site, I'll never know. It's sad to see this mall go, but I tend to blame the idiots who put it in that spot in the first place. Granted, Haywood Mall didn't open until 1980, and there was no anchor overlap for 20 years, but Greenville Mall was boxed into a corner from the start.